The rate at which champagne glasses were produced – not unsurprisingly – mirrored the rate at which the sparkling wine itself grew in popularity, Having begun the 18th century as a relatively unknown product of provincial vineyards, there was an explosion in popularity once the drink had been introduced to the upwardly mobile, chattering classes of middle England, and before the close of the Regency period, production had morphed in to a substantial multi-national industry. Consequently, early examples of stemware which can be identified as being purposed for the consumption of champagne are quite rare, but – conversely – later vessels were produced to service a burgeoning mass market, and are therefore quite common. By the early years of Queen Victoria’s reign many of the still-current “big names” in the trade were already established, following in the footsteps of Veuve Cliquot who first formalised the methodology and practicalities of large scale production. Bollinger, Krug and Pommery all took their place in the directory of producers, joining the likes of Moet & Chandon, Piper Heidsieck and Taittinger – already extant for decades, albeit on a smaller scale. This was, of course, simply a case of supply keeping pace with demand, as champagne was by now the “go to” drink of any discerning Victorian socialite, largely due to the fact that it became more and more widely available as transportation across Europe became easier to effect. Its appeal was broadened by somewhat curious means on occasion – it became hugely popular in Russia, for instance, having been shipped there in bulk amongst the supplies of Napoleon’s Grand Armée on their ill-fated march to Moscow. Although formerly a drink of almost universal appeal, there was a conscious effort by producers to position their product at an ever higher level in the social stratosphere with endorsements by gentlefolk of esteemed standing being commissioned by way of early “celebrity advertising”. By the time that France was fully immersed in La Belle Epoque the drink was irrevocably established as the intoxicant of choice for the upper classes, and its transition from populist tipple was complete. This repositioning was, of course, reflected in the glasses which were by now specifically designed for the drink. Having reached its high water mark of popular appeal at a time that the techniques of bulk production were beginning to be applied to glassmaking, there were swathes of relatively plain, slice-cut flutes on the market, even before the yet more generic moulded pieces began to appear. However, given the carefully cultivated perception of exclusivity, there is also a rich seam of highly decorated, very finely enhanced champagne glasses from the 19th century to be appreciated too. Naturally, these more decorous pieces tended to be in the coupé style, as the bowl shape was far more conducive to the application of engraved designs which – as was the case across all glass types – was a great favourite of the Victorians given its suitability for the depiction of specific, ornate and very elaborate scenes, as well as having an inherently ostentatious comportment. 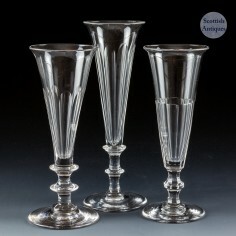 A fine trio of Victorian champagne flutes which can be found on our scottishantiques.com online store alongside a wide range of rare and interesting antique drinking glasses. 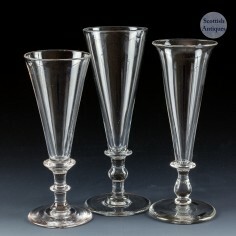 This attractive trio of vintage champagne flutes can be found on our antique glassware store at scottishantiques.com.